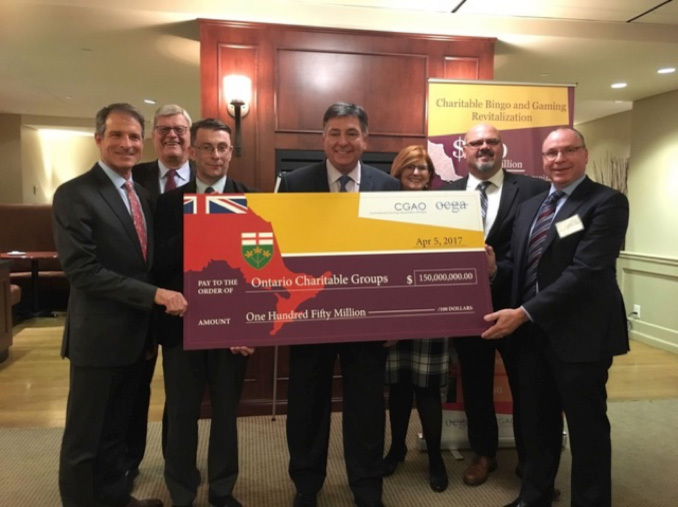 On Wednesday, the 5th April 2017, the Commercial Gaming Association of Ontario and Ontario Charitable Gaming Association played host with other partners of the Revitalization of Charitable Gaming to celebrate a major achievement in the life of this important initiative. This event was held at Queen’s Park - Legislature Main Building. Joining members of Commercial Operators, Charities, OLG representatives and AGCO representatives were 26 MPPs from around the province to see the Minister of Finance, Hon. Charles Sousa, receive the cheque for 150 Million Dollars. This year the province of Ontario celebrates its 150th year since becoming a province with Canada. This is a remarkable achievement by any standard, to have the Crown, Communities and Commerce working so closely together to maximize their mutual goals. It was tremendous to share this occasion with our primary partners OCGA, OLG, and AGCO as we presented Minister Sousa with a very large cheque. We must not forget that this moment doesn’t occur without the tremendous hard work undertaken by numerous people. I would therefore like to thank Mr. Rick Gray and c-Gaming Team, Mr. Tom Mungham and the AGCO, the municipalities where we are operating, Ms. Lynn Cassidy and the OCGA Members and finally the people that make all this possible, the CUSTOMERS. A very good evening was had by all and long may it continue and strengthen as we go forward. Just wanted to remind all members & readers that the Canadian Gaming Conference is fast approaching. This important event will be hosted in the city of Vancouver between the 19th June and 21st June 2017. This is a great platform to see what is happening within the broader gaming sector and to network with fellow industry colleagues. This is the first year we have joined our Charity Partners (OCGA) in jointly hosting the Charitable Gaming Track for the conference and we are developing a very informational and educational program for those attached to the Charitable-Community Gaming space. I would encourage you to register, remembering to sign up in the Charitable Gaming Track/Stream. This can be done at www.canadiangamingsummit.com. The CGAO and AGCO are undertaking a pilot project in Ontario that focuses on bringing greater awareness to the Registrar’s Standards for gaming. This is being undertaken in combination with an educational college to provide educational content and a method of measurement to ensure we capture the impact or effectiveness of the initiative. It is going to be launched in Vancouver at the Canadian Gaming Conference and then deployed in Ontario in early Fall 2017. This is a further example of the Regulator (AGCO) and Industry (CGAO) working together to meet our mutual objectives. In my mind it is a reflection of the progressive and innovative approach that is being undertaken by the AGCO. The CGAO will host its 6th Annual Golf Day on Thursday, the 8th June 2017, at the Springfield Golf & Country Club in Guelph. Over the last few years this event has been a tremendous opportunity to network in a relaxed and enjoyable setting. I want to thank all those members who have continued to support this great event and welcome anyone who is interested to join us and register a team or place a sponsorship. This is a reminder of our upcoming AGM on the 9th May 2017, to be held at the Holiday Inn, Airport (East) Road, in the Centennial B room. All formal notices have been issued to all members. If you have not received a notice please notify our office immediately at (416) 245-6365. If you are a member of good standing and intend to be at the AGM, please inform our Administrator (Ms. Sandi Nesbitt) at nesbitt.s@sympatico.ca. The CGAO and Play-Smart (OLG) are undertaking a pilot project in Windsor Centres on how to effectively introduce a Play-Smart co-ordinator to campion and be the point person on the ground around initiatives relating to Play-Smart. Clearly, our objective is to ensure we have a measured & balanced approach that is reflective of the operating environment and strengthens the work that has been achieved in order that it builds in a constructive fashion and engages our staff and customers. It was announced on the 31st March 2017 that Innova Gaming Group launched a strategic review process. There are numerous press articles recently of a potential offer to acquire shares. If you need additional information please, in the first instance, contact Mr. Peter Howard, Director Customer & Government Relations at their subsidiary Diamond Game at phoward@diamondgame.com. Please be advised that the CGAO office will be closed from Thursday, 13th April until Tuesday, 18th April. If you require anything throughout this period, contact Peter McMahon direct via e-mail.